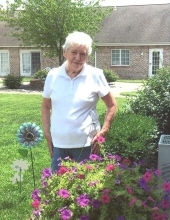 80 year old Fairfield, Illinois resident Deloris "Sis" Jean Wilson passed away March 6, 2019 at Deaconess Midtown Hospital in Evansville, Indiana. On angel wings she flew to be met by her parents Ozzie and Odessa Wilson and other family members who greeted her arrival. Deloris was born June 28, 1938 in Wood, South Dakota and was the second child of Ozzie and Odessa Williams Wilson. After graduating from high school in 1956 from Wood, South Dakota she joined the Air Force. She thoroughly enjoyed the military and often spoke of her military service with pride. She then married and became a mother to Ray and Jeanne Long. Deloris was an elementary teacher and librarian in Upton, Wyoming; Onida, South Dakota and Pierre, South Dakota which she enjoyed very much. She spent her retirement years in Spearfish, South Dakota and Fairfield, Illinois. She loved flowers and was a very proud Great Grandma. Deloris is survived by her children, Ray Long of Phoenix, Arizona and Jeanne Jenkins and her husband Chris of Fairfield, Illinois and her granddaughter Mindy Diehm and Andy Hill and their children Mia and Romi, Fairfield, Illinois and grandson Drew Diehm of Presho, South Dakota. Also surviving her are her brothers and sisters: CL (Skook & Joann) Wilson of Anthony, New Mexico; Myrna Chewakin and husband Ron of Spearfish, South Dakota; Bill Wilson and wife Paulette of Richmond, Texas; and Dixie Wilson (Donn Voorhees) of Rapid City, South Dakota; along with several nieces and nephews. A graveside service for Deloris "Sis" Jean Wilson will be held at 10:00am, Monday, March 11, 2019 at Maple Hill Cemetery with military rites provided Anthony Wayne Post 176 American Legion and Wayne Memorial Post 4535 VFW. There will be no visitation. Friends and family are asked to go directly to the cemetery. Memorials may be made to the American Diabetes Association and envelopes will be available at the graveside or at Nale's Funeral Home. 1914 County Rd. 905 N.